I enjoyed it so much, I searched out and read every other book that author had written, even going so far as to order the only one the library didn’t carry. I also read about World War I – particularly the flying aces of that time – plus novels about World War II, a couple thrillers set during the Cold War, and at least one book about the first U.S. war in Iraq. I remember almost nothing about any of these past books I read: not their titles or authors. Nor can I recall what any of them were really all about – whether they were in support of whatever war they dramatized or took a more anti-war stance, demonstrating the negative consequences of war on soldiers and their countries and society – consequences that go far deeper still than just the death of comrades-in-arms. I can take a wild guess as to which, though, if for no reason than it wasn’t until I stopped reading military fiction that these consequences became apparent to me. Although I don’t read straight-up military fiction anymore, wars and rebellions seem to find their way into the genres I do read/watch – fantasy, sci-fi, historical, YA – with startling regularity. More often than not, these conflicts are glamourized and normalized, especially (but not exclusively) among entertainment geared toward youth. I find this troubling. With the growing acknowledgement and evidence surrounding the psychological effects of war on both combatants and civilians constantly being reported, I would love to see more stories that focus on these effects in a meaningful way*. I’m not claiming that war is never necessary. 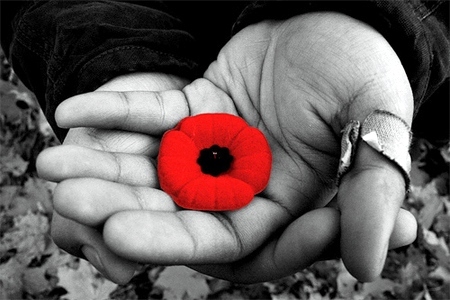 I recognize how the contributions and sacrifices of so many Canadian soldiers during World War I and World War II went on to shape the societal advancement of Canada, and afford us so many of the rights and freedoms I both enjoy and take for granted on a daily basis. I recognize that we live in a world where people in power don’t always respect the basic rights that all human beings deserve, and that when that happens, it’s often only through physical force that the problem can be solved, at least initially. But neither will I agree that every war from the past hundred years was absolutely necessary, to say nothing for all of those being fought today. Yes, humanity as a species is a violent one, but we’re also a rational and creative one, with many techniques of diplomacy at our disposal. Rather, what we often lack is the will to make use of that diplomacy and creativity, for a whole host of nefarious and convoluted reasons. I would like to see the stories we tell in popular media become, if not more peaceful and resourceful in how they tackle their story problems (which act as surrogates for those we face in real life), than more honest and nuanced about the effects of war and violence, and how they come to change people, often irrevocably. If I were to go to the military fiction section of the library today, would I even find any novels about soldiers struggling with PTSD, depression, misplaced violence, or suicidal thoughts, or would it just be more tales of glory, honour, regret for fallen comrades, but, overall, the impression that it’s always worth the cost? I hope the former, for the stories we tell ourselves influence our beliefs, our behaviour, our perception of what’s possible and desirable for the future, and our priorities to affect change. *One YA series, though problematic in other ways, that does a great job of this, was the Hunger Games trilogy, especially the third book, Mockingjay. This entry was posted in Preoccupied and tagged Books, Military fiction, Peace, Reading, Remembrance Day, War, Writing, YA fiction. Bookmark the permalink. I’d be surprised to find modern novels that glory in warfare Janna. The wraps are well and truly off the psychological damage suffered by combatants in recent conflicts. Surely those writing historical fiction would take a more realistic approach to both the horror of the whole damn thing and the lasting impact it had on the survivors. I really have no idea as to the state of modern military fiction, Roy, not the pure MF genre that I used to read. Of that sub-genre which one might call military sci-fi, however, it seems to me that for the most part, there’s still a lot of glorification going on, as if authors believe that for society to advance technologically in a substantial way, we’re going to have for it. My father’s military career definitely influenced the way he raised me, so I think it was inevitable that I’d become interested in that lifestyle, at least for a little while. I’m not sure about fiction, but I’ve come across a number of non-fiction titles by former soldiers (Jarhead, for example) that are highly critical of the war industry, which is what it has become these days. Good point, Eric. I’m familiar with Jarhead, and I’ve heard in passing about a number of other non-fiction books and biographies discussing the suffering and abuses soldiers often face in the military. We need to hear even more of these stories.